About 150 green sea turtles have been tagged and released into the ocean by The University of the South Pacific’s School of Marine Science since 2015. This is part of an ongoing project that has enabled researchers to gauge and monitor the feeding, breeding and migration patterns of the species. Green Sea Turtle has been given an endangered conservation status by the International Union for Conservation of Nature (IUCN). 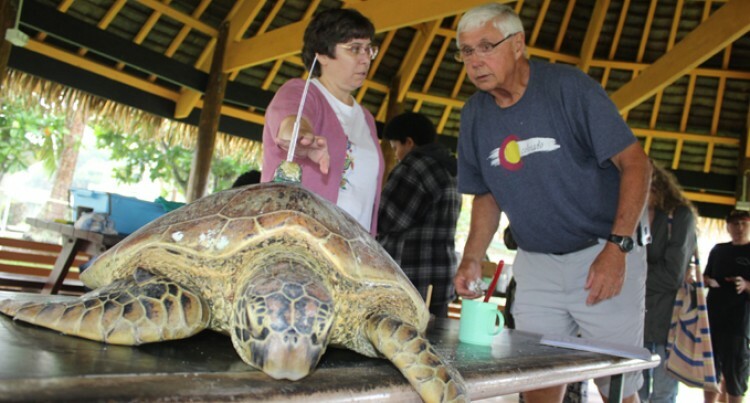 The School of Marine Science conducted a three-day workshop, which ended on Saturday, with the theme: Conservation of Sea Turtles within the Cultural Context of Oceania – Possibilities beyond Protection. And in concluding the event, a green sea turtle, otherwise known as the green turtle, black (sea) turtle or Pacific green turtle was released with a satellite tracking device attached to it. Susanna Piovano, a senior lecturer at the school said: “This project aims to monitor the foraging grounds, feeding patterns and migratory paths of these turtles. The project was funded by the National Oceanic and Atmospheric Administration (NOAA) and led by director of Co-operative Sea Turtle Research Programme at Hawaii Preparatory Academy, Marc Rice. Mr Rice said the expensive exercise should be monitored well and continuous research should be done. The cost of one satellite device is up to US1000 (about F$2114.25). Moreover, the turtle population in the country has undergone a lot of human impact to survive the changing environment, says Ilisapeci Narube, Project Officer of Mamanuca Environment Society (MES). “There is evident consumption of turtles, even from the egg stage people are trying to harvest,” she said. Ms Narube was also devastated by the number of turtles that were caught and eaten by people. “Even though the moratorium is there people are still requesting permits and approval to harvest these turtles,” she said. The destruction of the breeding grounds (nesting beaches), more development projects, littering cases, improper waste disposal were some of the major dangers affecting the turtle population in Fiji, she said. Lusiana Ranadi, the project officer of the United States of Sustainable Tourism Project at MES, said commercial and subsistence fishing vessels also caused a major decline in the turtle population. “A lot of these things are known by the public, but the lack of proper monitoring intensifies the steep decline of turtle population,” Ms Ranadi said. “Hopefully the moratorium will be in effect next can be moved to enforcement areas and also standard work operation procedures for seeking approval on harvesting turtles and empower communities in the conservation of turtles and why Fiji is placing the Moratorium Act and the Fisheries Act,” she added.